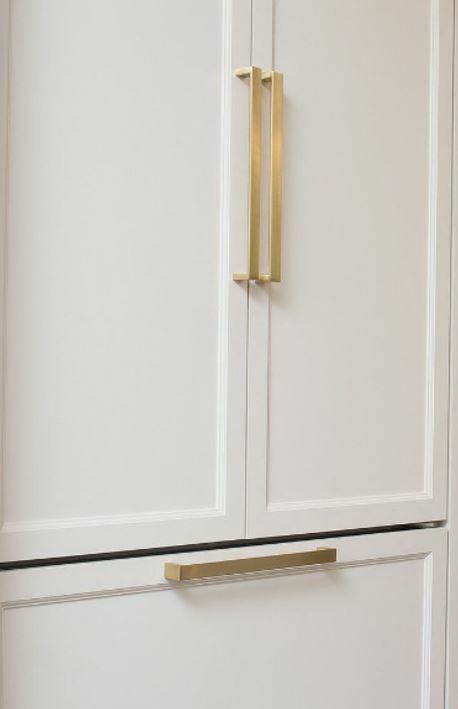 Cabinetry hardware is the jewelry of the cabinet. 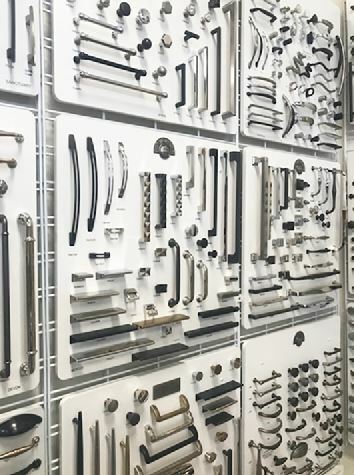 For door hardware, cabinet hardware and accessories…black is in (well, it never really went out). This started trending in Europe and soon after, headed our way. 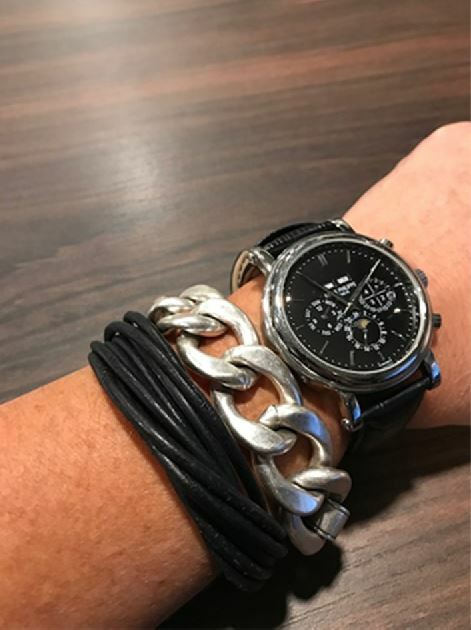 Black is the color most associated with elegance and riches and it never seems to really go out of style. It is weighty and carries its own. On a lighter cabinet, it’s fabulous! Don’t worry if you have a brushed nickel faucet, you no longer have to match your cabinetry hardware to your plumbing. In BC times (blah cabinetry), we matched finishes for plumbing, lighting and cabinetry hardware. When it was brass………it was brass everywhere. 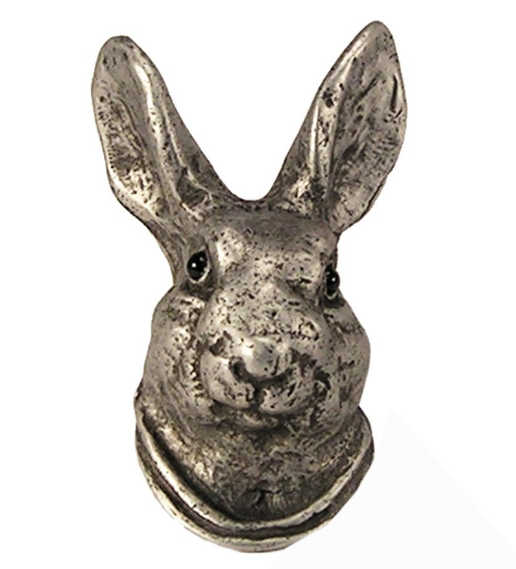 When brass was gone and brushed nickel landed on the scene……….it was brushed nickel everywhere. No longer! Relax, have fun and mix up those metals. Now don’t go throwing caution to the wind and just start buying hardware because you think it’s cool. There still has to be a reason to mix it. 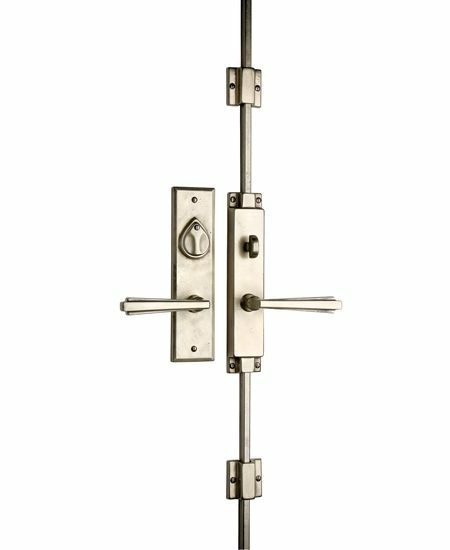 You still need to pay attention to the style of hardware and reflect the style of the door itself as well as the home it’s in to fuse the design together. 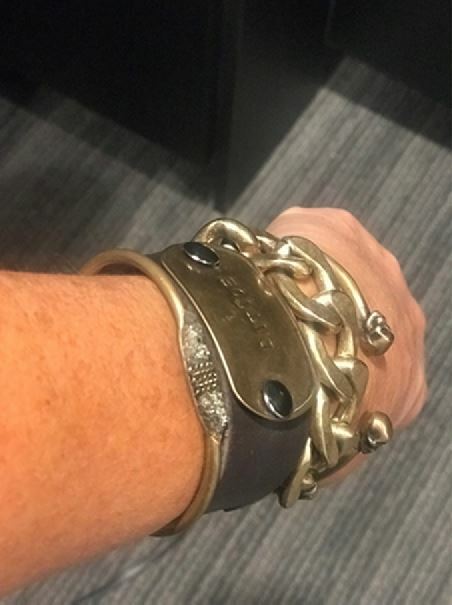 Like using jewelry to tie an outfit together. Want to really blow your mind? Two tone hardware has arrived! Finally, hardware that blends with more pieces and colors and makes our lives easier. This trend has allowed the perfect way to join rooms and finishes. Have a chrome faucet but don’t want chrome on your hardware? No sweat, find a two-tone option and start the flow of mixed metals throughout the house. Design is getting smarter! Another thing you don’t have to match is the style. Don’t necessarily think “theme” but keep in mind style differences and the “why” behind them. Placement of hardware needs to be thoughtful and right. Although it’s just the functional way to open storage, your money can be spent good…or it can be spent bad. 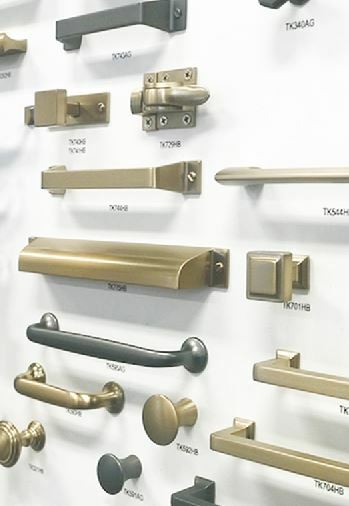 Paying attention to line, size, color and material can allow you to mix up hardware and make an individualized statement. Look at your room and think of the different banks or sections of cabinets. You can treat each separately and create a ton of interest for your cabinets. In my office, I selected hardware that was all relatable but different. 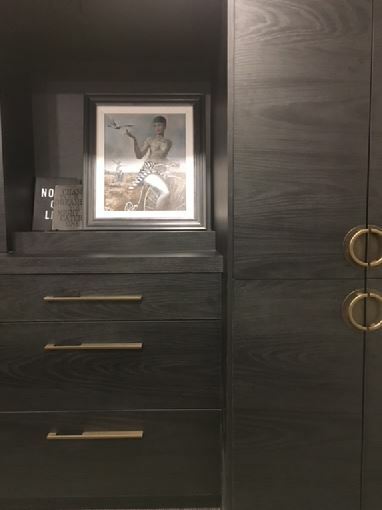 I love that the armoire doors are capped off with a pull that has an eastern feel and although round, it answers right back to the linear elongated pull on the drawers. I didn’t want too much of a good thing so the flip up cabinets are understated in a simple yet dramatic knob. If you love something, hold on long enough and it will come back around. Tons of gold hardware is hitting the scene! Coppers, oil-rubbed bronzes and goopier styles are back in addition to the sleek and refined looks. Design is not static, it comes and goes and ebbs and flows. As designers, this is a great way to update a room. 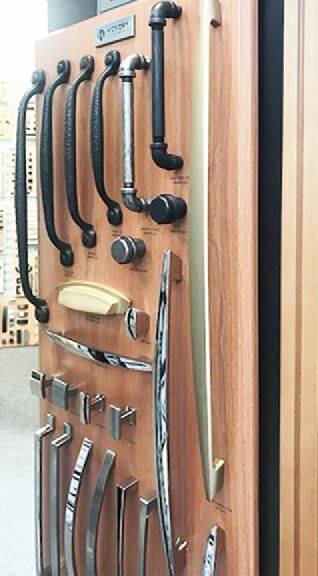 New cabinetry hardware can breathe life into a setting. As big as hardware is getting for some styles, making it invisible is huge for others. In a contemporary kitchen with clean slab doors, hardware does not want to be seen. Still needing the function, the trend is toward finger pulls. These are pulls mounted at the top of the door and keep quiet, letting the door get all the attention. 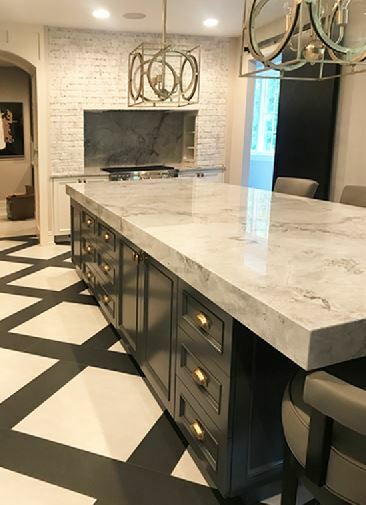 In this same style, recessed pulls can be used which are cut into the face of the cabinet but still streamlining the look and keeping the plane clean. Cremone bolts, oversized hardware and novelty knobs will do just this. • Cremone bolts are making a splash right now. 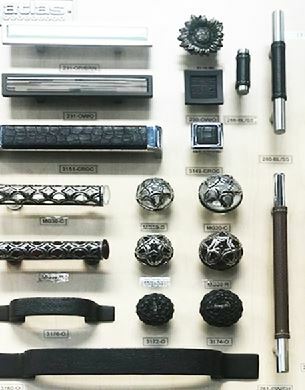 These are knob systems with vertical rods. 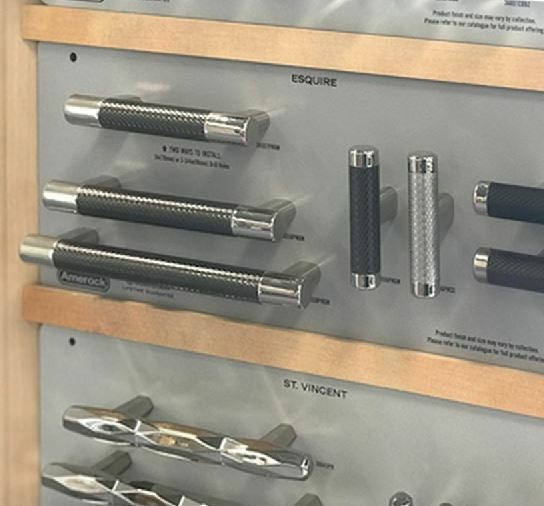 • Oversized hardware can fill the length of the drawer or be used in just a few areas. Often called appliance pulls, putting them long ways on a door, across a drawer or on the wood faces of appliances can offer a distinct look. • Novelty knobs can be fun, but this is the first thing you will most likely get sick of. You can purchase a spoon door handle for your kitchen, but why would you? You’ll see it every day and come to hate it. However, a pretty crystal knob in a powder bath or a baseball in a kid’s room can be fun. 1. In high use areas make sure you can easily grip the hardware. 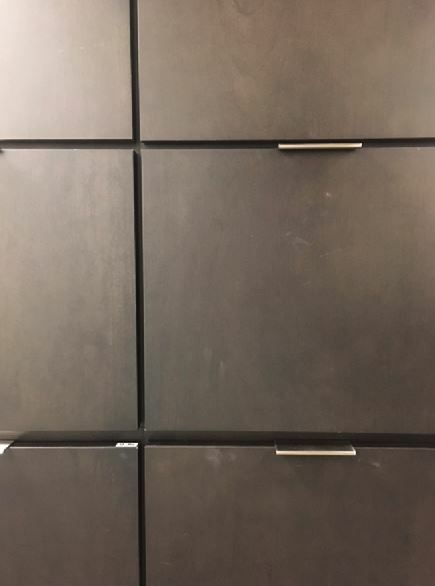 It’s nice to have great looking cabinets, but you need to easily get them open. 2. Don’t worry about where knobs or pulls go. If you like pulls, put them everywhere and vice versa – maybe just size them differently to go with the scale of the cabinet. 3. Don’t be a slave to hardware. Change it up every couple years for interest, but just know that you can’t always change sizes without incorporating a back plate (which are big right now, back plates are back)! 4. 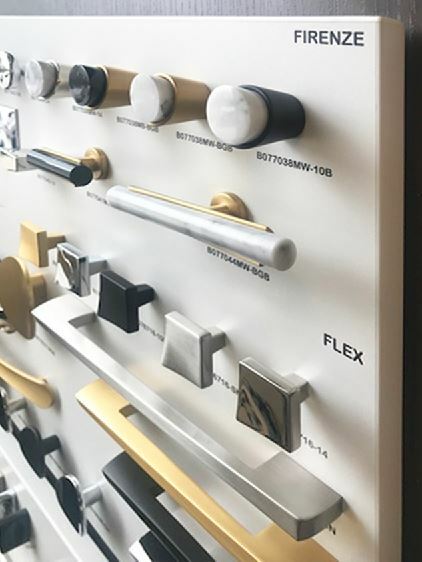 On bigger cabinets use multiple knobs/pulls or longer pulls. When using longer ones, don’t cheap out – fill that space up with hardware (3/4 of the length is a good rule of thumb). It will cost you, but it will look great. 5. Draw elevations of your room cabinets and measure the space where you want to put the hardware. There is nothing more frustrating than getting home with hardware that is too big or too small. If you don’t want to go to that trouble, put a tape measure along the space and snap a picture (we’re that good)! 6. Add bin, cup pulls or drop handles to the mix. These are great on drawers and very functional. 7. Try to make your cabinets look like furniture pieces. Hardware can help accomplish this. 8. Call us or use a hardware specialty company. Don’t get your hardware from a box store, find something special that makes your heart sing!